On New Year's Day 2009, an unarmed black man named Oscar Grant was shot and killed by a police officer, after a scuffle had broken out on an Oakland passenger train. He was 22 years old. Fruitvale Station seeks to tell Oscar's story, reconstructing his last 24 hours based partly on verified incidents and meetings that are known to have occurred. Some of them paint a heartbreaking picture of family life; earlier the same evening, Oscar buys crabs for gumbo and celebrates at his mother's birthday party, along with his girlfriend and young daughter. It's difficult to imagine that a few hours later he will be forced to the pavement by overzealous policemen and shot. Director Ryan Coogler chooses to frame the personal story in a simple, verité documentary style, filming warmly-coloured family interiors and funny or casual incidences in Oscar's life. His final day is laden with both happy and anxious moments. He loses his job, plays with his little girl, discovers a stray dog that's been hit by a car, buys birthday cards - deeply ordinary events, but focused upon and structured in a way which seems to point to their artifice. It's all building to something, but therein lies the problem; the overt foreshadowing can clang uncomfortably against the realist form. 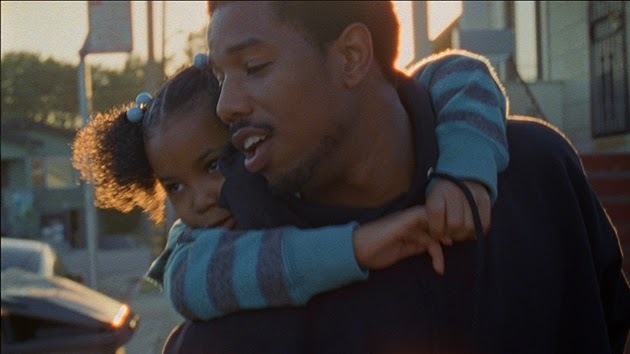 Particularly with actors so naturalistic and nuanced, it's surprising how little subtlety Fruitvale Station employs. Michael B. Jordan is a likeable, mercurial presence, unafraid to reveal Oscar's faults - his philandering, his previous prison stint, his difficulty holding down a job. Nonetheless, the director goes to great lengths to illustrate Oscar's fundamental decency and kindness. With the strong support of Melonie Diaz (as his girlfriend), and Octavia Spencer as his wary-eyed mother, the actor needs no continual series of events to build his case; I, for one, believe easily in Oscar's essential goodness, in his loving relationship with his daughter, and in his striving for a better life. He doesn't need to watch a pitbull die in the road for me to feel for him as a person. He doesn't need to promise his little girl that he'll be "just fine" one last time for me to be outraged by the absurd manner of his death. Yet Coogler never gives the audience the benefit of the doubt in this way, always going a contrivance too far. It seems that in Fruitvale Station's justified attempts to memorialise Oscar - as well as to portray the ugly senselessness of his death - it waylays its own structure, and falls flat in any formal sense. There are, though, many strong individual moments in the film - and it cannot help but to be devastating. Coogler never shies away from suffering, moving from ambulance to hospital to waiting room with the same cold, gut-wrenching stillness. The final question left in our ears leaves us to wonder - how does one explain what happened to Oscar Grant in 2009? This thing that continues to happen, and has since happened to Trayvon Martin? How do we explain this to our children? While Fruitvale Station may possess little in the way of consistency or delicacy, it has on some level succeeded purely through telling Oscar's terrible story. What it has to say is important; how it says it is deeply flawed.